Real Lives, Real Faces, Real Diseases, Real Prevention, Vaccinate!! How many tears must we cry and how many must die or be debilitated before they listen. 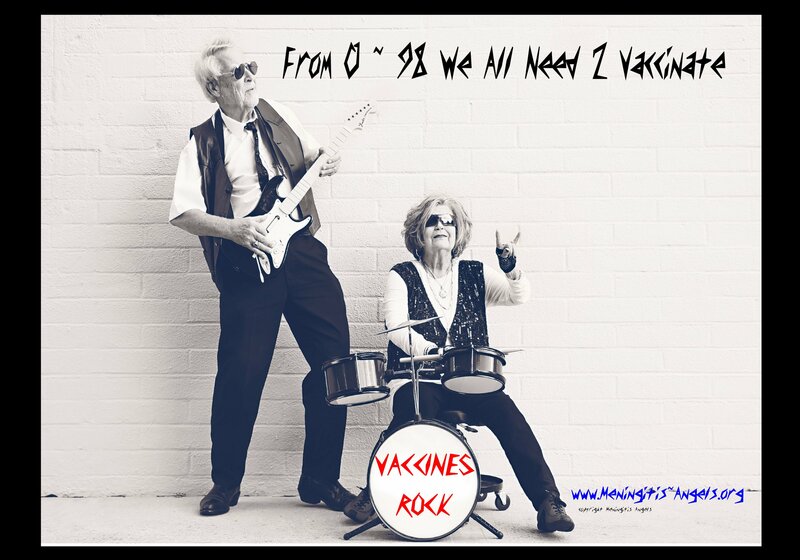 As a senior adult you need vaccines too. Pneumococcal disease, including pneumonia, bacteremia and bacterial meningitis, is a serious health threat to Americans. Each year, it causes the deaths of approximately 40,000 Americans, most of them over 65 years of age. U.S. Public Health Service data suggest that nearly half of those deaths could be prevented if people 65 and older and others in high-risk groups were given pneumococcal vaccine. — Persons aged 2 or older with compromised immune systems including those with HIV. Each year in the United States, pneumococcal disease, which is caused by the bacteria Streptococcus pneumoniae, accounts for an estimated 3,000 cases of meningitis (infection in the brain and spinal cord), 50,000 cases of bacteremia (infection in the blood), 500,000 cases of pneumonia, and seven million cases of otitis media (ear infections). Fatalities are highest among those with bacteremia and meningitis. Among elderly with pneumococcal bacteremia, the mortality rate is 30 to 40 percent. Pneumococcal vaccinations generally need to be given only once. If there is uncertainty about earlier vaccinations, the vaccine should be administered to anyone 65 or older or anyone else in the high-risk groups. There are more than 33 million Americans who are 65 and older and more than 21 million Americans who fall into other high-risk groups. Pneumococcal disease together with influenza and other vaccine-preventable diseases now cost society an estimated $10 billion each year. Approximately 90 percent of all costs associated with treating pneumococcal infections are for required hospital care. “Influenza and pneumococcal vaccination are cost-saving because the costs of vaccinating all elderly persons are less than the costs of providing medical care to those who develop influenza or pneumococcal disease,” said Walter Williams, M.D., chief of CDC’s Adult Immunization Branch. More than 2,000 health care professionals, scientists and researchers are meeting this week during the 31st National Immunization Conference held here. Conference attendees are exploring the latest research and policy issues related to vaccine-preventable diseases and immunization for children and adults in the United States. Other Vaccine Preventable Diseses you need to protect yourself from. every year, and about half of them are 60 years old or older. Additionally, over 60 percent of seasonal flu-related hospitalizations occur in people 65 years and older. Talk with your doctor or other healthcare professional to find out which vaccines are recommended for you at your next medical appointment. It’s hard to come by experienced people for this subject, but you sound like you know what you’re talking about! Both DEADLY, but only one is vaccine preventable. So Vaccinate!! !